When dealing with a large crowd, ensuring safety becomes exponentially more difficult. Our Safety Products can assist you with crowd control and help you avoid injuries and keep your crowd safe. Several of our products serve as both safety and crowd control devices. For example, take a look at our Tensacone Safety Cone. The combination of the retractable stanchion and cautionary cone helps you restrict unsafe areas by both blocking off the area and using a cone to indicate risk. Oftentimes having a simple black stanchion doesn’t send the message that stepping beyond this point will put you at risk, which is why the Tensacone has a black and yellow diagonal stripe belt that sends a clear message. We also have a wide selection of cones and caution signs pictured below. Our bright yellow plastic wet floor signs can be read from 30 feet away and are able to fit between doorways and narrow spaces. We offer these signs in multilingual English, Spanish, French and German. We also carry a variety of metal detectors. Our M-Scope Portable Walk Through Metal Detector is great for any large event, school, courtroom, or train station. If you’re looking for something slightly smaller, as part of our hand-held options we have a Hand-Held Concealed Weapons Detector that is capable of locating all types of metal. This detector comes with the option of various frequency settings to avoid any interferences. We also carry a standard Hand-Held Security Metal Detector , along with other metal detecting devices. Safety is always first. Browse our entire selection of Safety Products here. For many, Black Friday is an opportunity to stock up and save money. For those of us managing the lines and storefronts on this crazed-shopper holiday the day takes on a very different purpose- to control the crowds. The best way to keep one of the largest and hungriest crowds of the year under control is to be prepared and educated on the best kind of equipment to use. If you know that you will be handling a long and growing line, we recommend using our Galvanized Steel Barriers built from high quality carbon and steel. These barriers are designed to be weather resistant, stable, and extremely durable against a large moving crowd. We also recommend using Stanchions to control lines within a store. When several customers are in line to purchase it’s always best to organize the lines with stanchions to avoid confusion and potential frustration among customers and employees. We have retractable belt stanchions available if you anticipate the need to adjust stanchions and reorganize lines throughout the course of your business hours. In addition to handling the crowd already standing outside or inside your doors, you need to be prepared for the vehicle traffic that comes before and after your shoppers arrive. Several of our Traffic Control products will come in handy when directing crowded and hectic parking lots or structures, such as our traffic cones and reflective vests. Let us help you lighten your load this Black Friday with the right equipment to keep you and your customers safe and organized. We’re well into October and that means Halloween is around the corner. Whether you’re dealing with running a popular costume store, especially the day after Halloween when items hit the sale rack, or trying to manage a concert venue or Halloween event, crowd control barriers are necessary to make your job easier and keep everyone safe. Our variety of crowd control products will ensure that you will find the perfect tools to control your crowd- It doesn’t matter if you’re anticipating a rougher, louder crowd, a costume hungry crowd, or a fan-crazed crowd anxious for a concert, we have the devices to keep your space under control. If you know that you will be monitoring a large crowd in and out of a venue, we definitely recommend our Portable Barriers. Our Portable Barriers and Retractable Belt Stanchions are great for crowds that vary in size and require several entrances and exists in and out of a space. When concerned with both personal and public safety, we suggest pairing our Portable Barriers with signs. If you’re searching for something stronger and more stable, take a look at our Galvanized Steel Barriers that are built from high carbon steel and hot-dipped galvanized to withstand tough weather conditions. Additionally, the uprights are fully inserted into the frame before welding, providing extraordinary strength. Because of their strength and durability, these Steel Barriers are best for directing large crowds at festivals, fairs, stadiums, convention centers, and similar venues. Browse through our website to find exactly the tools and accessories you’ll be needing this Halloween. Let’s keep it under control! Tips to keep your smallest guests safe (and crowd control equipment in tact) at amusement parks, zoos, trampoline facilities, children's museums, aquariums, and more. PRIME stanchions and accessories are intended for lighter traffic, low-abuse environments such as bank queue lines. We strongly recommend using standard Retracta-Belt series stanchions for child-friendly environments, since they are built to withstand the wear-and-tear in airports and stadiums. For an economically priced stanchion that will hold up in child-friendly areas, the Value Series is the ideal option. These posts are made of the same construction and quality as our standard Retracta-Belt series, but package pricing and reduced options keep the price down. Nearly all Retracta-Belt stanchions are available with an Extra-Heavy 30 lbs. Baseweight for added stability and are much more difficult to pull over. For easy transport with these heavy bases, we also recommend adding wheels to the base. The wheels engage only when the post is titled backwards and pushed, and will not cause the post to move while flat on the ground. We have four permanent or semi-permanent mounting options for our stanchions. These prevent the posts from being shifted throughout the day from children pushing or leaning on the posts. The Mini Socket Mount is especially useful for child-friendly environments because it is spring-loaded, so posts lean about 10 degrees to absorb impact. The standard height of a Single Line Retracta-Belt is 40" and small children can easily walk under the belts while in a queue line. Dual Line Retracta-Belt Stanchions feature a second belt at 20" above the ground, providing an extra layer of security. Post-N-Beam Systems eliminate the need for a belt in the post, and instead provide a structural barrier in its place. While children can pull on the belts and cause damage or wear-and-tear, beams are heavy-gauge aluminum and are less tempting to play with. Beams have safe radius edges and seamlessly integrate with Retracta-Belt Stanchions and receiver posts. Post-N-Panel Systems provide a solid structural barrier in place of belts. They can act as a temporary wall and restrict access entirely, providing much more security than belts in areas that are potentially hazardous to children. Panels seamlessly integrate with Retracta-Belt Stanchions and receiver posts. They also serve as a custom signage display for graphics such as games and cartoons, keeping children preoccupied while on line and therefore less likely to resort to playing with equipment. Children can play with the plastic post caps and twist them, breaking the connection where the screws connect to the post. 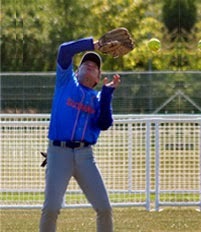 This results in the spring case breaking or other damage. Metal post caps prevent this tampering. Freestanding Sign Stands are more difficult for children to tamper with than signs and sign frames mounted onto posts. Our Removable Designer Series Sign Frame Brackets slide in and out of the sign post top and are less prone to damage than threaded post-mount sign frames if constantly swiveled and played with. The sooner you detect a problem, the better. Sometimes an inexpensive solution or replacement part can significantly increase the life of the post. If the belt is not needed, retract it so it stays inside the post. Children won't be tempted to play with the belt, and will reduce creasing. All belts include a red slide action manual locking belt clip. Beams are available with an optional Locking EZ Off End Blocks. We recommend always locking belts and beams into place to prevent accidental release. 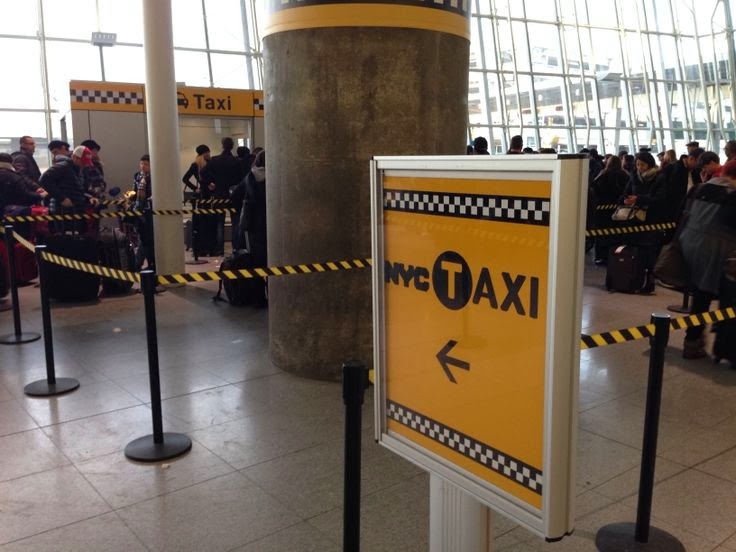 The NYC Taxi Stand at JFK International Airport uses utility stanchions with black and yellow diagonal posts to control the queuing of passengers waiting for a taxi outside of the terminal's baggage claim area. The retractable belt stanchions with black and yellow diagonal stripes offer a visual cue that coordinates with the NYC Taxi stand look and feel.